Onswipe had a pleasant surprise for the press at their event today. I was not there myself (it's amazing how emails can go awry) but I have read some fascinating details about it. In addition to the new app-like theme for the iPhone, Onswipe also announced a new layout editor which is going to let bloggers customize their own theme. Onswipe launched in 2010 with a novel goal. 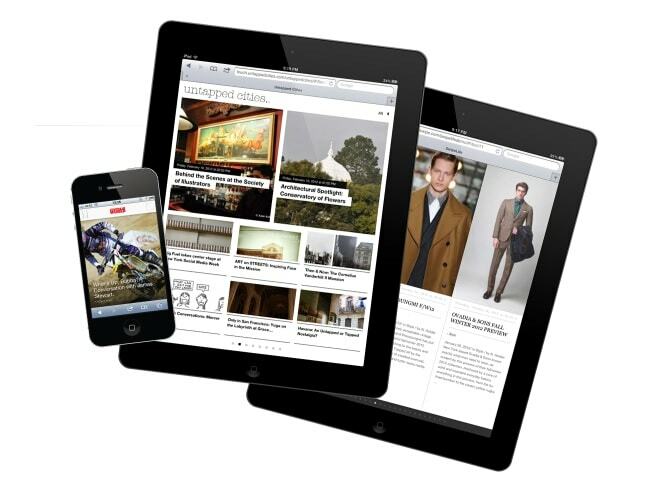 They wanted to give all blogs and news websites a simple and easy to implement app-like user experience on the iPad. The service has gone through a couple major releases and today they showed off their next step: letting publishers have a greater hand in designing the iPhone and iPad themes. As you can see in the video below, OnSwipe Draft is designed to let publishers and developers customize many of the details of the Onswipe theme they use on their blog. It lets them work directly with the CSS, if desired. They can build a new theme from scratch or take and modify one of the dozen diverse menu templates and article layout templates. What's more, Onswipe also lets the non-techie designer do a fair amount of customization with the stock theme components. It's rich in features, but is it worth the work? Yes, actually. It turns out that Onswipe and their partners have observed a noticeable increase in traffic, just like I reported having observed on my own blog earlier this week. While I had seen a 20% or more growth in mobile traffic (in less than a month), some of Onswipe's partners have been tracking their mobile traffic for a year now and they've seen an average increase of nearly 300%. It seems that any site which lacks mobile visitors has an excellent opportunity to grow them. Even if the mobile visitors are negligible, pretty much all you need to do is to support them (make it easier to read the content) and they'll flock to the site. But Onswipe Draft is not all Onswipe showed off today. They also now offer the same app-like experience on the iPhone as they do on the iPad. OnSwipe for iPhone lets publishers save time and money by taking the existing content and displaying it so it looks like an app. They can pair high-resolution imagery and touch interactions to offer what is hoped to be a better experience for the reader. The new iPhone support includes all the features of the iPad version, including favorites, recommendations, and content categories. Publishers can also add their preferred accent color and logo to make their site a truly unique experience. As great as this is, note that I'm not using it. While I've dabbled with OnSwipe once or twice, I've come to the conclusion out that the iPad can handle regular websites just fine. And while the iPhone and other smartphones need a theme that works better with their screen size, I'd much prefer to offer a theme that supports all my mobile visitors, not just the tiny minority that have an iPhone. I have far more visitors on Android than iOS, so naturally they are important to me. But I'm also hesitant to use Onswipe for the simple reason that it only supports iOS. Even if the iPhone represented a bigger share of my mobile traffic, I'd still avoid Onswipe just for the sake of offering a consistent experience across all devices. Then again, that boost in traffic does tempt me. I cannot help but wonder if I could pick up even more traffic by adding Onswipe again. I wonder if free WordPress will offer it? Likely customizing it will be part of Premium. I even doubt they’d offer some free templates for it. Besides, as you point out, the iPad displays sites just fine as-is. And free WordPress’ default mobile theme seems to be enough for me.